Karl Ulrich Schnabel. He started duo performances and recordings with his father, Artur Schnabel, in the 1930’s. Beginning in 1939, he played internationally in an increasing number of duo appearances with his wife, the American pianist Helen Schnabel, in concertos for two pianos and orchestra as well as in recitals for one piano, four hands. In 1956 the Duo participated at the Holland Festival in five performances with orchestra and in 1972 at the Edinburgh Festival. They appeared regularly in most European countries, throughout the United States, and in Canada. Six years after his wife’s death in 1974, Karl Ulrich Schnabel formed a new duo with the Canadian pianist Joan Rowland and gave concerts with her extensively in the United States, Canada and Europe for over twenty years. The Duo’s yearly schedule of performances has included programs in North America and Europe at such prestigious locales as the Ravinia Festival, the Roque D’Antheron, the Lockenhaus and Maryland Festivals; the Frick Museum in New York, the Queen Elizabeth Hall in London, the Philharmonie in Berlin. They have broadcasted repeatedly over the German radio network. The Piano Duo Schnabel specialized in performing works of the rarely heard literature of original compositions for one piano duo. This original literature for one piano four-hands is extensive, rich and varied: four volumes of music by Schubert, five sonatas and a set of variations by Mozart, a large selection of pieces by Beethoven, Schumann, Weber, Mendelssohn, Brahms, Bizet, Debussy, Ravel, Dvorak, works by Christian Bach, Clementi, Diabelli and many 20th century composers, such as Hindemith, Poulenc, Rachmaninoff, Crumb, Stravinsky, Krenek. Breathtaking virtuoso brilliance, grandiose symphonic form and content, and also delightful miniatures with haunting simple folk-tunes are to be found. 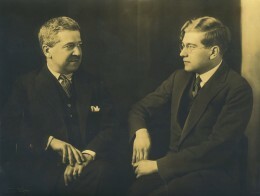 The international acclaim of the Piano Duo Schnabel was partly due to their pioneer work in this field, bringing many hidden treasures to the concert stage and the larger public. Fortunately the Duo issued many recordings over the years, all available today.